Compact digital cameras a silver, right? And digital SLRs are black, OK? What part of that simple fact doesn't Ricoh understand? Today it launched a compact model that looks, at first glance, like an SLR job. 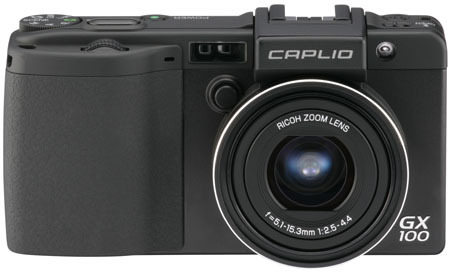 Say hello to the Caplio GX100, a ten-megapixel machine with a lens that's described in terms of f numbers - 5.1-15.33mm, 1:2.5-4.4, since you ask - rather than optical zoom factors, just to show you how serious this camera is. It does have a 4x digital zoom, and its sensitivity runs to ISO1600. The camera contains the usual anti-shake technology. The GX100 uses SD cards for storage, including the new SDHC format, and there's 26MB of on-board memory. The camera has a 2.5in LCD viewfinder - and here's another feature borrowed from the SLR world: the LCD folds out and can even be removed altogether. The GX100 also has a video port to allow it to be hooked up to a TV. Ricoh's baby is powered by AAA-sized rechargeable batteries good for 380 shots, the company claimed - falling to 35 shots if you plug in a pair of AAA alkalines. The GX100 with electronic viewfinder included will be available at the end of April 2007 for around £400. Maybe time to put down that Bitcoin-mining rig and pick up that spade?